Established in 1997, Japan Foods Holdings Ltd (Japan Foods) is presently one of the largest Japanese restaurant chains in Singapore with presences across main markets in Asia such as China, Hong Kong, Vietnam, Malaysia and Indonesia. As at 30 September 2018, Japan Foods operates 74 restaurants, where 53 of them are based in Singapore. It is worth S$ 76.4 million in market capitalization. In this article, I’ll bring an update on its latest financial results, discuss its future plans for growth and assess its investment potential at its current stock price of S$ 0.44 per share. Hence, here are 12 things to know about Japan Foods before you invest. Presently, Japan Foods operates 15 restaurant brands. Out of which, its 3 biggest revenue contributors are from Ajisen Ramen, Menya Musashi and Osaka Ohsho. 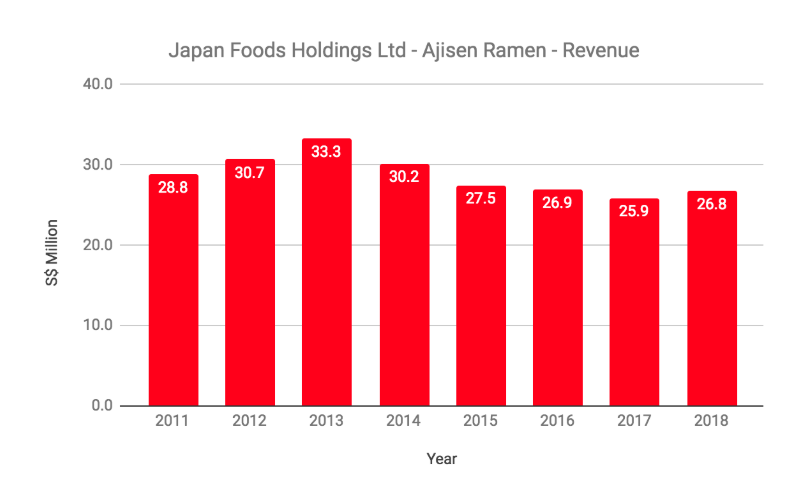 Collectively, they have accounted for 69.4% of Japan Foods’ total revenues in first half (1H) of financial year (FY) 2019. Source: Japan Foods’ Financial Results Presentation May 2018. Presently, AR remains as Japan Foods’ largest income contributor. The proportion of its contribution, however, is declining. This is due to AR’s ongoing reduction in number of restaurants from as high as 33 in 2013 to 20 outlets as at 30 September 2018. Revenues from AR had dropped marginally from S$ 33.3 million in 2013 to S$ 26.8 million in 2018. MM is the second largest income contributor and an important growth driver to Japan Foods. Since its launch in April 2012, it has expanded its network of MM to 29 outlets where 11 are located in Singapore, 10 are based in China, 7 in Hong Kong, and 1 in Indonesia. As a result, MM has achieved rapid growth in revenues, up from S$ 5.5 million in 2013 to as high as S$ 15.8 million in 2018. OO is the third largest income contributor to Japan Foods. Presently, it operates 5 OO outlets in Singapore. Sales had dropped marginally from S$ 8.6 million in 2016 to S$ 7.9 million in 2018. Takahashi Kenichi is the largest shareholder of Japan Foods with direct shareholdings of 65.95% as at 21 June 2018. He is the founder and now is appointed as the Executive Chairman & CEO of Japan Foods. Also, Ms Chan Chau Mui has direct shareholdings of 4.65% of Japan Foods. Chan is currently appointed as the Chief Operating Officer of the company. 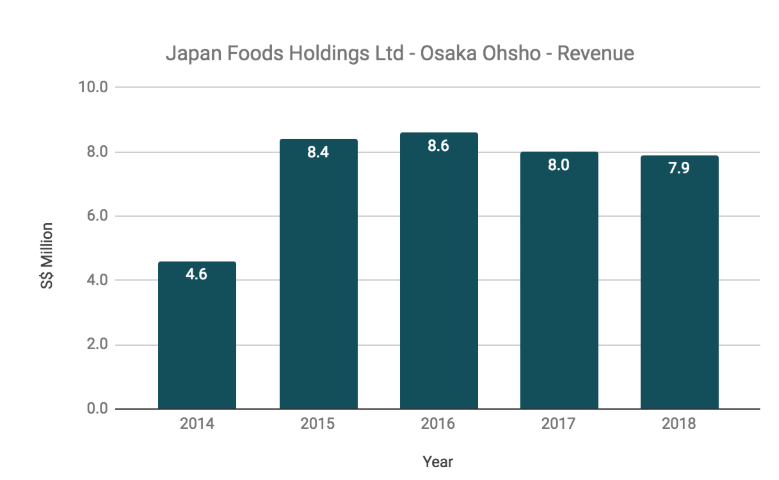 Overall, Japan Foods had achieved growth in revenues, up from S$ 43.7 million in 2010 to S$ 67.8 million in 2018. This is directly contributed by a steady increase in number of outlets from 28 in 2010 to 68 in 2018. A big part of the increase comes from MM during the period. 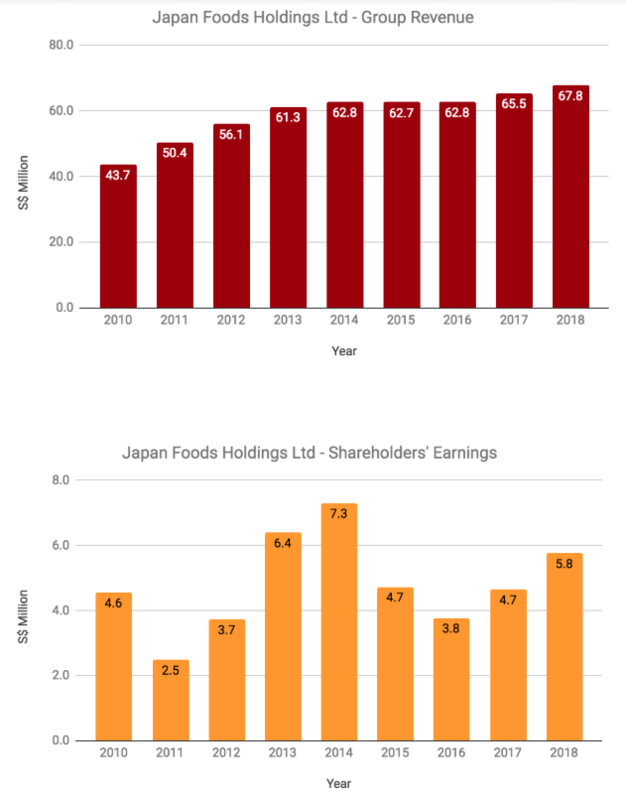 However, Japan Foods has experienced a slight dip in profit margin and it caused shareholders’ earnings to remain around S$ 5 million per year from 2010 to 2018. For the latest 5 years, it achieved an average return on equity (ROE) of 16.85% per year. It means, it has generated S$ 16.85 in annual earnings from every S$ 100 in shareholders’ equity over the 5 year period. 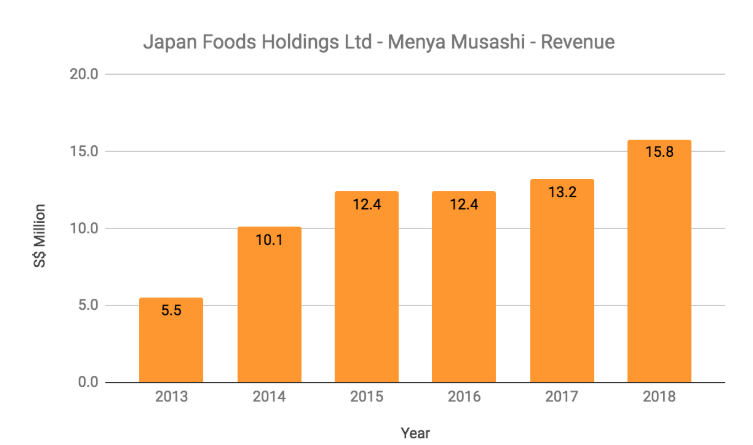 From 2010 to 2018, Japan Foods had generated S$ 83.1 million in cash flows from operations. Out of which, Japan Foods has incurred S$ 43.2 million in capital expenditures and paid out S$ 21.2 million in dividends to reward its existing shareholders. Hence, its cash reserves had grown from S$ 6.8 million in 2010 to S$ 19.8 million in 2018. 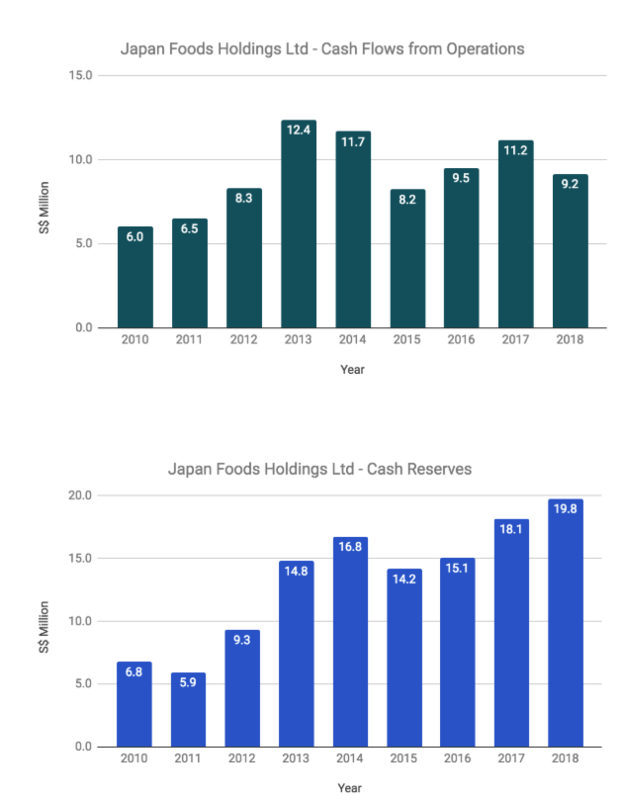 As at 30 September 2018, Japan Foods has maintained cash reserves at S$ 19.4 million. It has a current ratio of 2.81 and no gearing ratio as the company has no borrowings. Japan Foods has introduced two new restaurant brands into Singapore. In June 2018, it opened its first Konjiki Hototogisu outlet at CHIJMES. In July 2018, it opened its first Kagurazaka Saryo at VivoCity. On 7 December 2018, Japan Foods had entered into a Memorandum of Understanding (MOU) with Minor Food Group (Singapore) Pte Ltd with the intention of setting up a 50:50 joint venture company to conduct & operate existing restaurant brands by them in Singapore, Thailand, and China. The MOU would open doors for Japan Foods to launch a handful of its food brands in China and Thailand via the joint venture company. 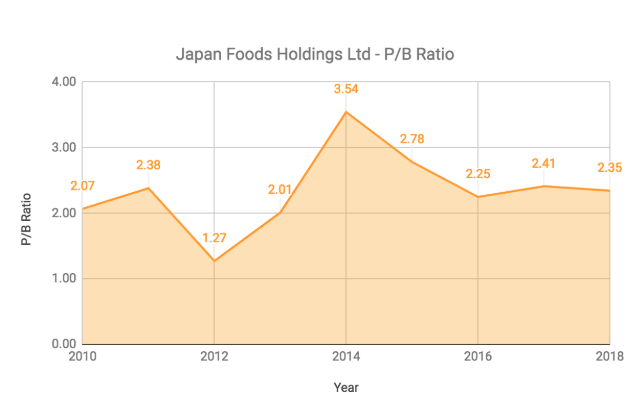 Japan Foods made S$ 5.0 million in shareholders’ earnings or earnings per share (EPS) of 2.89 cents for the last 12 months. Thus, based on its current stock price of S$ 0.44, its current P/E Ratio is 15.22. It is a little above than its 9-Year P/E Ratio Average of 13.19. 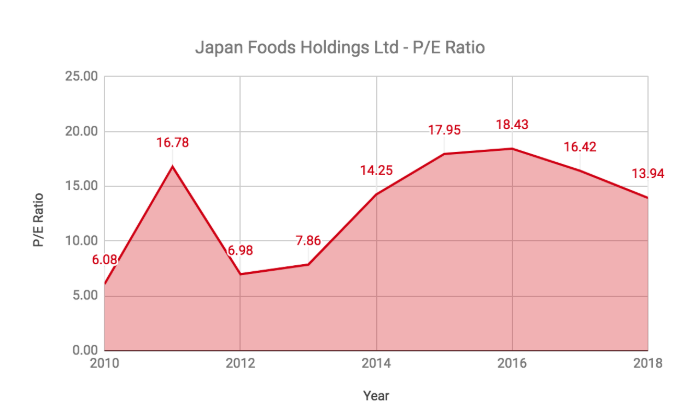 As at 30 September 2018, Japan Foods has reported net assets a share of 19.81 cents. Thus, its current P/B Ratio is 2.22. It is marginally below its 9-Year P/B Ratio Average of 2.34. 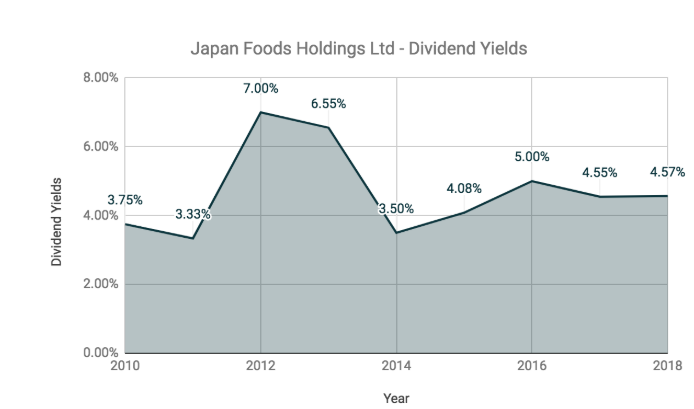 In FY 2018, Japan Foods has paid out dividends per share (DPS) of 2.10 cents. Thus, its dividend yields is 4.77% per annum if the company has the ability to maintain its DPS at 2.10 cents in the future. So, should we invest in Japan Foods at S$ 0.44 a share? Menya Musashi to drive growth for Japan Foods. 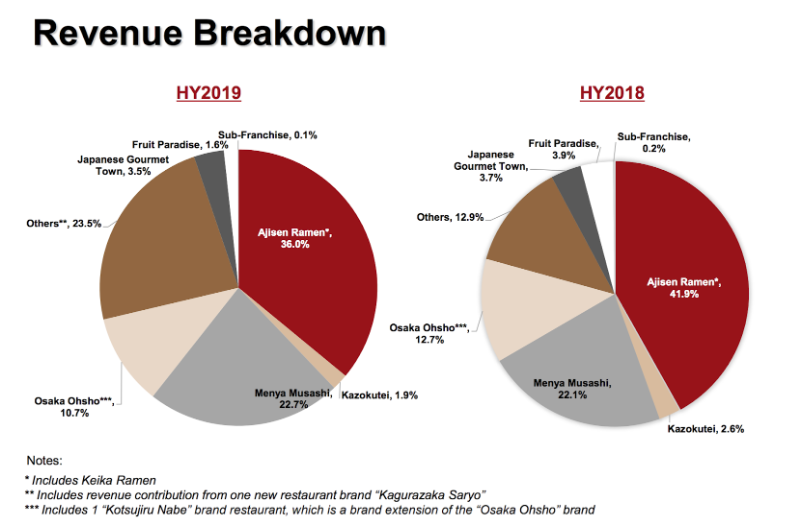 Introduction of New Brands such as Konjiki Hototogisu and Kagurazaka Saryo in FY 2019. Takahashi Kenichi, its largest shareholder remains hands-on in running Japan Foods as its Executive Chairman. Solid Balance Sheet with S$ 19.4 million in cash reserves and absolutely zero in debt. Growth in Payment of Ordinary Dividends for the last 8 years. Weaker Financial Results in 1H 2019 due to lower consumer spendings and rising manpower, rental, and utilities expenses. Lower sales from Ajisen Ramen as a result of closure of outlets located in Malaysia. ← Why Has DKSH Holdings Bhd Dropped 75%?